The Secretary of State (SOS) issued a Media Advisory today, rejected only 61 I-1000 petition sheets. This number was much lower than what our whistleblower informed us. We contacted SOS, and were given the following run down. And yes, you are reading the table correctly, I-1644 texts are on those I-1000 petition sheets. As the numbers above revealed, The SOS accepted 216 I-1000 petition sheets that were covered by stickers to hide the actual texts beneath. In other words, SOS allows I-1000 backers to bait and switch! Do you think this is acceptable? According to PDC report, a 300 petition sheet order on August 31, 2018 only cost them $255. Apparently, financial cost could not be a reason for them to use wrong petition sheets to collect signatures. The explanation lays in this Seattle Times article. According to the article, I-1000 backers collected 90,000 signatures during their failed attempt to collect signatures for I-1644. What can be easier than using the same exact texts to lure those who signed petition for I-1644 to sign petition for I-1000? Only that they need to cover those I-1644 texts up with stickers after they got the signatures. See below I-1644 petition sheet front vs. I-1000 petition sheet front (captured on August 30th, 2018). Other than design differences, ballot title and measure summary are identical in the two petition sheets. 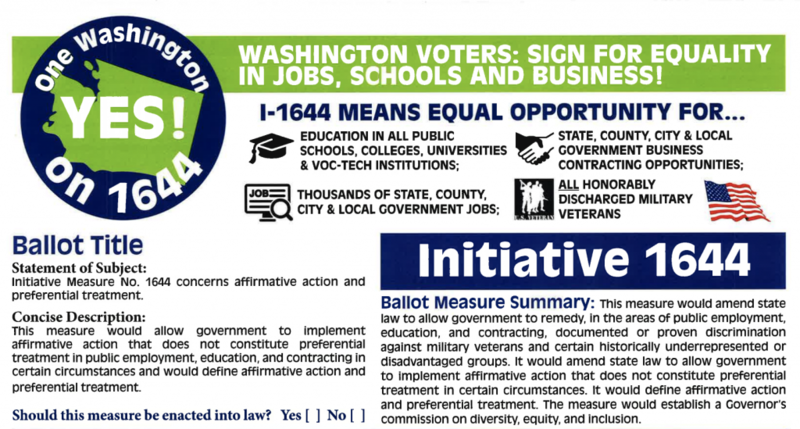 The truth is, I-1644 ballot title, summary and full texts are VERY different from those of I-1000. Below are AG approved I-1644 ballot title and summary. You can find I-1644 full text from SOS website. Statement of Subject: Initiative Measure No. 1644 concerns affirmative action and preferential treatment. Concise Description: This measure would allow government to implement affirmative action that does not constitute preferential treatment in public employment, education, and contracting in certain circumstances and would define affirmative action and preferential treatment. This measure would amend state law to allow government to remedy, in the areas of public employment, education, and contracting, documented or proven discrimination against military veterans and certain historically underrepresented or disadvantaged groups. It would amend state law to allow government to implement affirmative action that does not constitute preferential treatment in certain circumstances. It would define affirmative action and preferential treatment. 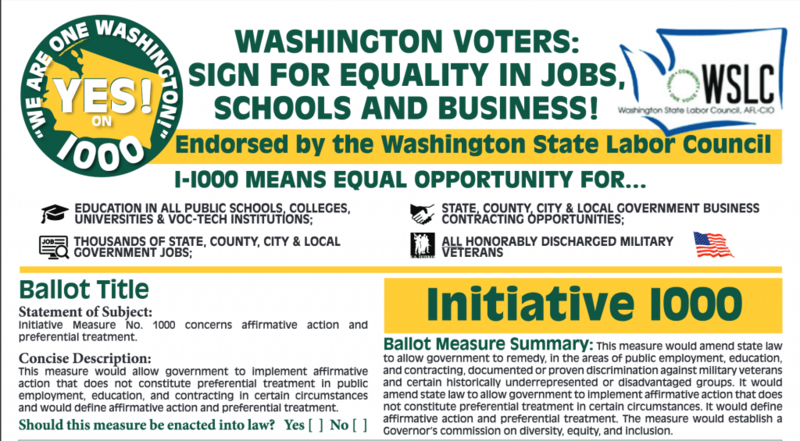 The measure would establish a Governor’s commission on diversity, equity, and inclusion. Below are AG approved I-1000 ballot title and summary. You can also find I-1000 text from SOS’s website. Statement of Subject: Initiative Measure No. 1000 concerns remedying discrimination and affirmative action. Concise Description: This measure would allow the state to remedy discrimination for certain groups and to implement affirmative action, without the use of quotas or preferential treatment (as defined), in public education, employment, and contracting. This measure would allow the state to remedy documented or proven discrimination against, or underrepresentation of, certain disadvantaged groups. It would allow the state to implement affirmative action in public education, employment, and contracting if the action does not use quotas or preferential treatment. It would define affirmative action and preferential treatment. The measure would establish a Governor’s commission on diversity, equity, and inclusion, and require the commission to draft implementing legislation and publish reports. According to PDC report, I-1000 backers paid for petition sheet design twice. The first time was on August 15th, the second time was on November 9th. Between August 15th, and November 9th, they ordered at least 1,550 petition sheets. If the 277 petition sheets are one of the 1,550 August 15th version of I-1000 petition sheets, where are the rest of those 1,550 petition sheets? We have requested to exam ALL submitted I-1000 petition sheets, and are told that we can’t exam those petition sheets till AFTER I-1000 is certified! If you support our effort, please contact SOS, and demand public scrutiny of I-1000 petition sheets. And definitely demand SOS to reject those sticker patched I-1000 petition sheets. Please call or email Assistant Secretary of State Mark Neary at (360) 902-4186 or mark.neary@sos.wa.gov.